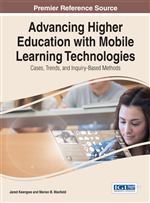 This chapter illustrates the potential of mobile social media to be used as a catalyst for collaborative curriculum redesign. The authors critique a case study implementing a mobile social media framework for creative pedagogies and draw out the implications of this framework for wider educational contexts. They conclude that an effective mobile social media framework for collaborative curriculum redesign must meet three goals: model the building of learning communities, explore the unique affordances of mobile social media to enable new pedagogies, and establish a supporting technology infrastructure. Balsamo (2011) argues that higher education needs a “reboot” in order to engage with new pedagogies relevant to today’s learners and their prospective professions. Such a reboot requires curriculum redesign, and Laurillard et al., (2011) argue that curriculum design should be a collaborative process, and should be regarded as a valid design science (Laurillard, 2012). The challenge of innovation in curriculum design is enabling lecturers to think differently or creatively about pedagogy, content delivery, and assessment, this effectively involves a culture change or ontological shift (Chi & Hausmann, 2003) where the role of the teacher, the learner, and technology are reconceptualised. Hase and Kenyon (2007) note that “people only change in response to a very clear need. This usually involves distress such as confusion, dissonance, and fear or a more positive motive such as intense desire”. Thus some form of catalyst is required to bring about pedagogical change. We argue that mobile social media is such a catalyst (Kukulska-Hulme, 2010) that enables a pedagogical refocus from teacher-directed content delivery to student-generated content and student-generated learning contexts. This refocus can be viewed as part of a continuum of pedagogical change enabled by new and emerging technologies, and the emergence of mobile social media in particular. We illustrate this continuum in Table 1. • Content delivery. • Web 2.0. • Student-generated content. • Mobile. The pedagogical integration of the technology into the course and assessment. Lecturer modelling of the pedagogical use of the tools. Creating a supportive learning community. Appropriate choice of mobile devices and Web 2.0 social software. Creating sustained interaction that facilitates the development of ontological shifts, both for the lecturers and the students.